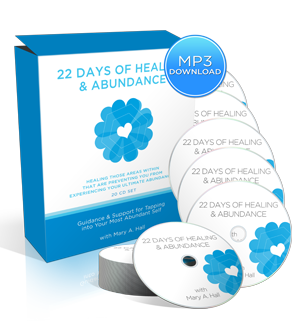 Introducing the 30-Day Abundance Challenge… This 30-Day Challenge was formulated out of the amazing transformation that Mary experienced during a six-week period in her life, 15 years ago, where she went from the depths of despair to experiencing hope, peace, and even contentment. As she prayed for help in her moments of darkness, she was given information that she clung to and actively applied to her life. This content is in part what helped to formulate her remarkable work and trainings in love, freedom, and abundance. One day, after 6 short weeks of Mary diligently applying these new ways of BEING, she noticed that she was happy and content for the first time… in a long time. Happy, despite some very intense life circumstances that she was in the midst of that would have previously taken months if not years to realign and open up hope around. As she sat in amazement with her new-found joy and contentment, it became clear that these new ways of BEING were truly the transformational content she was looking for and knew she had to offer it and share this profound process with the world. The teachings that Mary revealed in this life-changing program are simple, but you must make a strong vow to really immerse yourself in the teachings and principles and commit to applying them to your life each of the 30 days of the challenge… This way, you are more anchored into the process, and therefore, notice, witness, and enjoy these dramatic changes in your life. And you WILL, IF you ‘play full-out’ and actively apply yourself, your life will change too! Very simple, daily processes that will radically transform your life. These tools are very straightforward and will work if you are diligent and commit to using them DAILY. Abundance Muscles – in the same way we focus on individual muscles to strengthen and create a strong body, we have individual ABUNDANCE muscles that as we learn how to energetically focus on and strengthen by playing (being/working) in the energy to create a wholly-integrated abundant life. Three steps to TRANSFORMING your thoughts: Mary will teach you the three steps that, once applied, will radically change your way of being and your life. Powerful TRANSFORMATIVE content that will change the way you see yourself and view life: Mary will share life giving principles that work and why. She will teach you that by changing your focus you will radically change your way of being and your life. The power and roles of the Conscious and Subconscious minds – how they work in relation to each other creating the life you are experiencing and how you can REPROGRAM them to create the life you truly WANT to live. How to create a new relationship with money – understanding the true essence of the energy of money and using this to create and foster the relationship that will transform your relationship with money, shifting how it appears in your reality. How to identify the patterns of thought that have been creating your current reality and thus learning how to choose those thoughts that will create the life you truly want to experience. Everything is Energy – how the understanding of this is KEY to easily shifting the energy underlying any situation. Once you know this and know how to do this, you can shift and transform your experience in any and all areas – relationships, finances, work environments, etc. The steps and processes to play in Creation Energy – learning how to easily and simply ‘play’ in the energy that will create the life that you want and will transform any situation into what you ideally want to experience. 30 Audios – This is the ‘meat’ of the program and takes you day-by-day through new insights, actions, and processes that you can implement into your life. As you listen to one call a day and implement the teachings, your life will transform. 15 Support Audios – Mary has a Team of healing and coaching practitioners she works with and has mentored personally. They have created 15 audios to further support the teachings of this program from their own perspective – shedding light on how they’ve implemented the teachings into their lives. FOUR Bonus Audios – These introductory Bonus calls lay the groundwork and explain the science behind why these teachings and processes are so effective. Questionnaire – The questionnaire is a very important part of the process. It shines a light on your current state and maps your progress at the end of the 30 days. It is a powerful resource for you to use at the beginning of the challenge, but is also a powerful creative tool to use on an ongoing basis. Daily homework – You will be given simple, daily actions that you will take and apply to your life. These step-by-step instructions will ensure you are successful. Take a moment right now and commit to doing your daily play/homework and it will open the space before you even start for ease going through the program. AND receive support through Mary’s AMAZING Online Community. The Abundance Alive Healing and Coaching Support Community is chalk-full of support to assist and guide you on your healing journey. As you choose to join this community, you are opening yourself up to on-going support to assist you during and after the 30-Day Challenge. You will have access to live calls with Mary each week – where she will answer your questions, and offer additional support, guidance, healing and coaching. 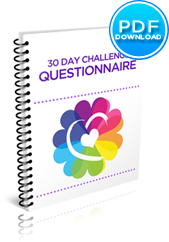 If questions arise, through your 30-Day Challenge, you will have direct access to Mary and her team, ensuring your questions are answered and that you receive the support you need. 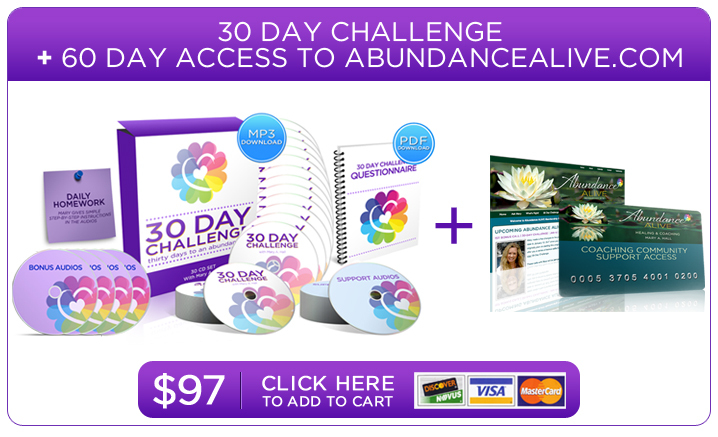 and gain access to experience the 30-DAY Challenge plus added bonuses! NOTE: As you join this program, you are also joining Mary’s powerful Healing and Coaching community. Private members receive amazing support during and after the 30-Day program AND by purchasing this program, you will have full access to the Healing and Coaching community for 60 days!